Osa Conservation’s rainforest camera traps have been capturing some very exciting footage recently! 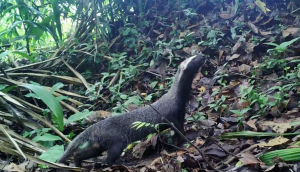 One camera recorded a particularly remarkable video of a Greater Grison. Watching clips of the camera trap footage in the D.C. office motivated me to investigate some of the more unusual species that are native to the Osa, starting with the Greater Grison. The Greater Grison is a member of the weasel family. It is native to South and Central America and inhabits forest and cerrado habitats. It is typically found near rivers or streams, and in elevations ranging from 500 to 2,000 meters. The Greater Grison population is actually doing very well, despite the fact that they are rarely seen in the wild. In fact, there is considerable debate in the scientific community over whether the Greater Grison is diurnal or nocturnal, which makes it all the more exciting that we got a video of one exploring the rainforest in the daylight! When the weasel-like carnivore is not hunting, it spends its time hidden away in dark and isolated spaces, such as hollowed out trees or abandoned animal burrows. It feeds on various vertebrates, including fish, amphibians, and small mammals. The grison has a particularly interesting hunting style. It begins by moving in a zig-zag pattern, stopping occasionally to lift its head and sniff the air. When it finally locates its prey, it gets very low to the ground and commences a series of grunts, which escalate to barks, and culminate in a single scream while fiercely baring its teeth. 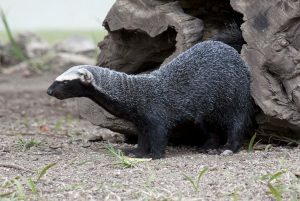 Once the grison catches its prey, it delivers a fatal bite to the back of the neck. Although the predators of the Greater Grison are not entirely known, they possess a distinct defense mechanism. When threatened, they will spray a yellow-green musk produced by its scent glands to thwart predators and mark its territory.